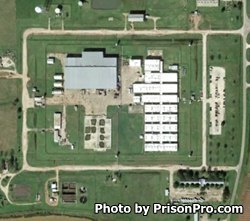 Located in Rosharon Texas, the A.M. "Mac" Stringfellow Unit is a mixed custody prison that houses offenders who range from G1 minimum to G4 medium high security levels. Situated on 15,000 acres of land the Stringfellow Unit is co-located with Ramsey and Terrell Units. The facility consists on 28 buildings, sixteen of which are for housing up to 1,212 male inmates. The main unit is comprised of 893 inmates, and the Trusty Camp houses an additional 319 offenders in five open bay dormitories. The average term an inmate is housed at Stringfellow Unit is nineteen years, and offenders range in age from 21 to 76 years old. Stringfellow Unit provides inmates with vocational classes in carpentry, and diesel mechanics. Inmates who do not possess a high school diploma are encouraged to take adult basic education, literacy and GED courses. Additional classes are provided that teach life skills, substance abuse education, cognitive intervention, and prepare an inmate for release (CHANGES program). In co-operation with Terrell and Ramsey Units, Stringfellow Unit employs inmates in the operation of a Cotton Gin, growing edible crops, a vegetable cannery, swine finishing, and raising cows and calves. Additional inmate operations include a Kosher kitchen, and a distribution/freight terminal. Before a you can attend a visiting session you must have an approved visitors application on file. Visits are held on Saturdays and Sundays at the Stringfellow Unit from 8am to 5pm. Visits are up to two hours in duration, however if you arrive at 4pm you will not have a two hour visit as all visits will terminate promptly at 5pm. Inmates are only allowed a single visit per weekend so be sure to coordinate your visit with the offender and always contact the facility prior to your visit to ensure the inmate is still located there and that visitation has not been canceled for any reason.